Hard disk drives (HDD) are electro-mechanical storage devices that use rotating magnetic media to store and retrieve electronic data. They were first developed by IBM in 1956 for the IBM 360 computer as the primary means to store large amounts of data. HDDs are now used in PCs, servers, external storage arrays and consumer devices. The form factor of HDDs has been continuously shrinking, from the original 24 inch diameter drives to 5.25 drives in the 1990s to 3.5 inch or smaller today. HDDs come in three form factors today: 1) 3.5 inch used for desktops, servers, storage arrays and consumer electronics. 2) 2.5 inch used for notebooks, servers, storage arrays, portable electronics. 3) smaller than 1.8 inch used for portable electronics. The HDD base contains mechnical parts. 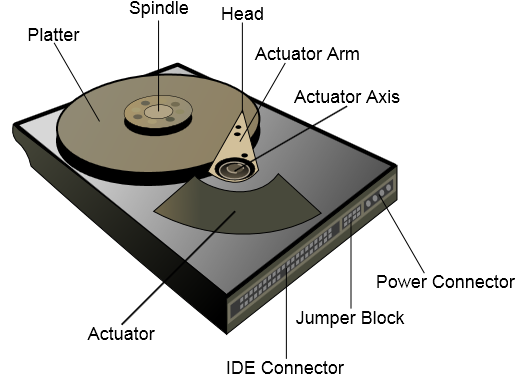 The magnetized data are stored inside the disks located in a HDD, and these disks are called platters (also known as “media” or “disks”). The platters consist of substrates and the media layer, which is thinly coated magnetic material (e.g. a ferrite compound) on the substrates (typically 10-20nm) and store the actual data. Due to the mechanical nature of HDDs, the platters have to be extremely smooth and flat, as uneven surfaces could lead to head crashes and cause the HDD to fail. This is becoming increasingly important, as technology advances have been increasing the rotation speed of platters and, at the same time, decreasing the gap between the platters and the heads. Aluminum substrates are mainly used in HDDs for desktops and servers, while glass substrates, which can be made thinner and are more heat-resistant, are used in HDDs for notebooks and other non-PC applications. Most HDDs have at least two platters and the capacity of the drive increases as the number of platters increases. Each platter is magnetized on each side, so a HDD with two platters has four sides to store data. The platters are clamped to a rotating spindle that turns the platters in unison and a motor is mounted directly below the spindle and spins the platters at a constant rate from 3,600 RPM (energy-efficient portable devices) to 15,000 RPM (high-performance servers /storage systems). As the platters are spun by the motor, heads read and write data to the platters. There is typically one head per platter side, and they are attached to an actuator arm (head actuator), which moves the heads around the platters. The PCB consists of several electronic components, including: (1) a Micro Controller Unit (MCU), which makes all calculations and converts signals during the read/write process; (2) a memory chip, which is used as a cache; (3) a Voice Coil Motor controller (VCM controller), which controls spindle motor rotation and movements of heads; (4) a flash chip, which stores part of the drive’s firmware (along with MCU); (5) a shock sensor, which detects excessive shock applied to the drive and send a signal to VCM controller; and (6) a Transient Voltage Suppression diode (TVS diode), which protects the PCB from power surges from external power supply. HDD components and finished HDD products are small and lightweight, and the associated transportation cost is low. As a result, the HDD industry’s production process is divided into several stages, and each of these production processes is done in different countries, mostly in Asia. The figure below illustrates a simplified manufacturing process for HDDs. 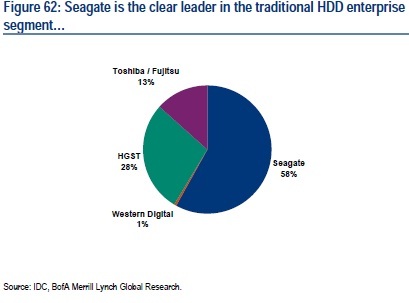 Asia accounts for the entire finished HDD units manufactured, with Thailand accounting for around half of global HDD production, followed by China (30%, driven by better access to PC contract manufacturers in China), Malaysia (12%) and Philippines (5%). Looking back, the evolution of the HDD industry in Asia started in Singapore, as Singapore had a number of location advantages for the HDD industry such as a tax incentive in the form of a full tax exemption for typically five years, and knowledgeable suppliers and labor. A number of semiconductor companies such as National Semiconductor and Texas Instruments had already shifted their production to Singapore in 1960s, developing adjacent IT industries in the region. Starting in the 1980s, HDD companies gradually moved their lower-end manufacturing facilities from Singapore to other lower-cost countries in Asia such as Malaysia, Thailand, and more recently, China, as a labor supply shortage in Singapore began to increase labor wages in the region. Specifically, Thailand’s promotion of foreign investment through various investment incentives (e.g. a full tax exemption for 3-8 years) in the 1980s, and Seagate’s decision to shift some of its assembly facilities to Thailand, catalyzed other companies to follow shortly. HDD component vendors design and manufacture mechanical / semiconductor components for HDD vendors. 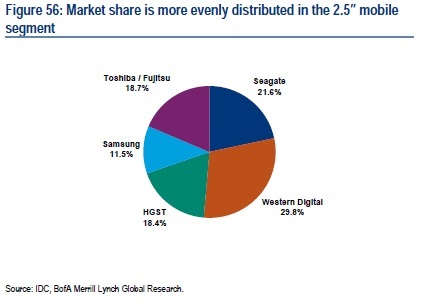 It is important to note that HDD vendors have been satisfying an increasing portion of their key component needs in-house to prevent any disruption in component supply and achieve higher profitability through vertical integration. For example, Seagate, HGST, and Western Digital procure some or most of head, substrate, and finished media in-house today. In addition, finished HDD assembly is often outsourced to the other HDD supply chain companies. 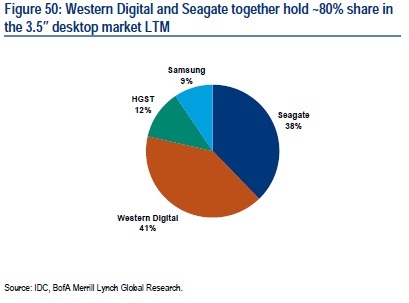 For example, TDK/SAE is responsible for manufacturing finished HDD products for Samsung (90%+ of Samsung’s monthly production capacity) and Toshiba (15% of Toshiba’s monthly production capacity).